Be prepared to cook hot, wholesome meals in an emergency, or simply stock your pantry for your family's everyday dining. Discover the convenience of having broths on hand at all times. 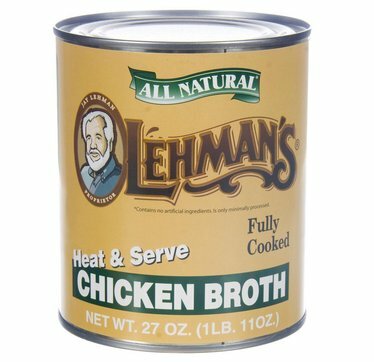 IMPORTANT PRODUCT INFORMATION: The shelf life of meat and broth is 5 years from the date on the can. The first alpha character denotes the type of meat: B=beef, C=chicken, T=turkey, P=pork. The first numeral after the alpha denotes the last number of production year: 9 = 2009, 0=2010, etc. The remaining digits are the day of the year according to the Julian calendar: Day 1 = January 1st, Day 365 = December 31st. Per the vendor, the meat used in this product is considered all natural and minimally processed. It is unknown if the animals were grass-fed or free-roaming. The vendor cannot ensure that this meat is antibiotic-free or hormone-free, but the USDA requires testing of all meat to make sure it does not contain harmful levels of chemicals including antibiotics when butchered. We always keep this on hand and enjoy it very much. It's the only chicken broth we use generally. Don't know what the person complaining of metal can taste is talking about. I normally make my own chicken stock from scratch, but like to keep this canned stock on hand for when I've run out of homemade and don't have time to make more. We try to minimize our sodium intake at our house, so I don't add salt to my homemade chicken broth, and we love the fact that no salt is added to this product. The chicken flavor really comes through! I ordered 3 cans of the chicken broth, and three cans of the beef broth. I used all the chicken broth to make Italian Wedding Soup. Unfortunately, it was not satisfactory. The soup was inedible, tasting of the tin can. I've since gone to making my own broth. I gave it one star for convenience. You may not want to publish this review, and I would understand. But seriously, it was not edible.